The car has been remapped but not on a dyno hence I have no print but it is stroking about 220 to 230. Easy to see and feel why the 16v are so sought after as they just fly. Original paintwork in great all round condition. New Red HT Performance Leads. Pioneer CD player and very good speaker system. Performance Stainless Exhaust system - nice sounding expensive on its own. Low mileage , lovely example ! Better pictures with car clean & polish coming soon! Runs & drives good, a real usable classic that will undoubtedly increase in value! Electric roof Two Keys Lots of history. Local VW specialists have wowed at this vehicle saying and i quote " FXXXXXG HELL, YOU HAVE MADE THE TSI BETTER THAN THE FACTORY MODEL ". 2012 VW GOLF GT TSI 1.4 IN BLACK - 210 BHP, 300 NM WITH THE FOLLOWING MODS. 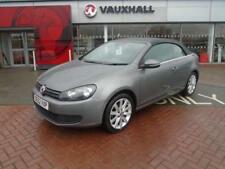 VW Golf Convertible, very economical 1.6 diesel manual. I've owned the car since the beginning of Feb 2018 and enjoyed every minute of it. MOT'd last October at 38438 miles. Full service history including a cambelt & waterpump service carried out on 23rd October 2018 at 38614 miles. One off truly stunning mk3 golf cabrio show car. electric windows x 4. electric roof. tonneau hood cover. car looks and drives like new. i will put a full mot on it for the new owner and also will get a full belts and water pump change done with receipt even though it doesn't need it just for your peace of mind. VW Golf Convertible Automatic. 2000W Reg. Lime Green. 63,000 miles. New cam-belt, water pump, battery, exhaust, brakes. Includes CD player/radio. Vw golf fsi 1.6. 2007. Vw golf fsi 1.6. Condition is Used. All from VW twickenham. The car was bought new from VW Vidas. It’s in showroom condition. But done scuff on driver door. Paperwork for. AA new battery. VW Golf Gti DSG.3 Door.FSH. TRADE INS. Car drives as it should with no known faults and wants nothing doing. Cambelt/Waterpump done at last service. 64467 miles.78621 miles.86555 miles and recently at 87621 miles. 2000 (W) VOLKSWAGEN GOLF 2.0 AVANTGARDE CONVERTIBLE...STUNNING EXAMPLE !! A rare 1999 VW Golf Cab in blue only 59000 miles and a full service history superb condition this car will only go up in value if kept in this condition . more info to follow . Call Phil on 07767621310 to arrange a viewing . Golf is sold as seen with two keys and Hains manual. Car has a power roof which stopped working last year and not looked into why, can hear motor for roof so hopefully nothing major. Alloys have marks and scratches. AUTO 2008 VOLKSWAGEN GOLF 1.9 TDi MATCH TURBO DIESEL 5 DOOR HATCHBACK. 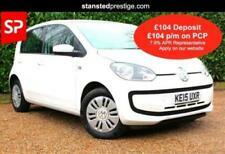 Remote central locking, Air Conditioning, Electric Windows, CD player, Great Condition. Excellent car and I'm sad to see it go. VOLKSWAGEN GOLF CABRIOLET PINK FLOYD EDITION. THIS CAR WAS PRODUCED FOR THE 1994 / 95 PINK FLOYD WORLD TOUR. VERY RARE CAR BELIEVED TO BE ONE OF ONLY TWO ORIGINAL PINK FLOYD EDITIONS LEFT IN THE UK ! THIS IS THE 1.8 CARBURETTOR MODEL (NON GTI) WHICH IS PREFERRED AMONGST MANY VW ENTHUSIASTS. VW GOLF MK1 CLIPPER (1.8 CABRIOLET). BEING A MK1 GOLF IT DOES NOT HAVE POWER STEERING. KARMANN EDITION WITH BIG BUMPER BODYKIT. 2013 Volkswagen Golf 1.4 TSI GT Cabriolet 2dr. Only 22000 miles, Very Good Condition Inside Out. Cat S ( professionally repaired). 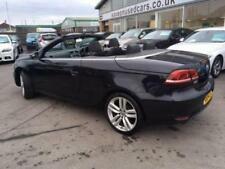 Black Golf Convertible 2.0 Tdi Automatic. Top Spec With Full Service History. 2 Remote keys. Mot Jan 2020. Only 49,000 Miles From New. There's Not Much The Golf Hasn't Got. Window Closures From Key. VW GOLF 2.0 TDI GT BLUEMOTION TECH 2 DOOR CONVERTIBLE - IMMACULATE EXAMPLE!!! VW GOLF VR6 4 MOTION 2.8. SPARES OR REPAIR. 88K MILES RECON GEARBOX NEW CLUTCH. WV GOLF VR6 4 MOTION 2.8L W reg. ENGINE RUNS AND IS VERY QUITE. VW GOLF SE BLUEMOTION TECH TDI 2.0 148 BHP 5 DOOR HATCH BACK BLACK WITH GREY SEATING TINTED WINDOWS - A/C - P/S - DAB - BLUE TOOTH - STREAMING - ADAPTIVE CRUISE - REAR ROOF SPOILER - MATT BLACK ALLOYS - CAM BELT CHANGED @ 45K WITH FULL SERVICE RECORD - DRIVES LIKE NEW.